Chanuka is arriving tonight! Woohoo! While Chanuka actually isn't a major holiday in Judaism, it still is a special time that I look forward to every year! I mean, a holiday celebrating oil? Great idea, right? I'm going to be bringing you some Chanuka-based inspiration over the next few days! Feel free to adapt ideas for your own celebrations, just enjoy them, or shout "blech" and spit your juice onto the screen (well, not in front of me, at least!). 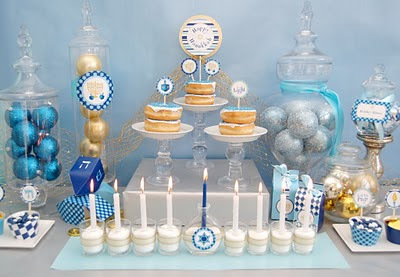 Today I have some FUN Chanuka links for you! Tablescapes, wine recommendations, games, scrappy products, and other fun is happening over at Crafting Jewish Style's blog! Next, a funny video--find it here on youtube. This is apparently what yeshiva students do in their free time. (And yes, most Orthodox pop stars wear glasses). 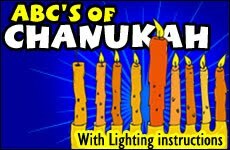 If you want to know more about the history of Chanuka, or need a cheat-sheet with the candle lighting blessings, check out this site. MMMMM Holliday food (feeling a bit like Homer simpsoon now..) I love ribs that is a coomon thing on the swedish christmas table, and i love all the candy ofcourse peanutbutterkisses, fudge you name it! Oh those look super delicious!! Yum! Love all the photos for your celebration!! happy chanuka!! gotta love potato latkes - my middlest's best buddy is jewish, and we joined their family on the last day of chanuka for latkes last year - yum!!! Happy Chanuka Keshet! There was a great piece on NPR this morning about how Chanuka deliberately became such an important part of American culture despite its otherwise relatively minor importance as a holiday. thanks for that link on the lighting. I have some of that info but needed more because we are trying to incorporate the holiday into our family. Happy Chanuka, Keshet! So, pardon my ignorance - but why are there two different spellings of the holiday? Is there a difference? 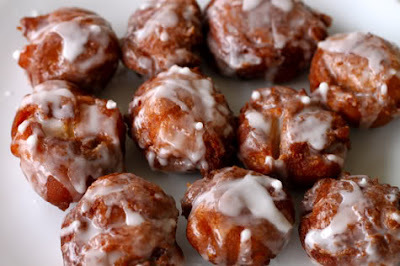 I'm all about the cookies & sweets this time of year - so those fritters are looking mighty fine to me! Yummmmmmmmmmm!!! Hope your first night of Chanuka is wonderful, Keshet! Oh, I love that party table!!! Happy Chanuka! :) I love the ornaments in the jars!